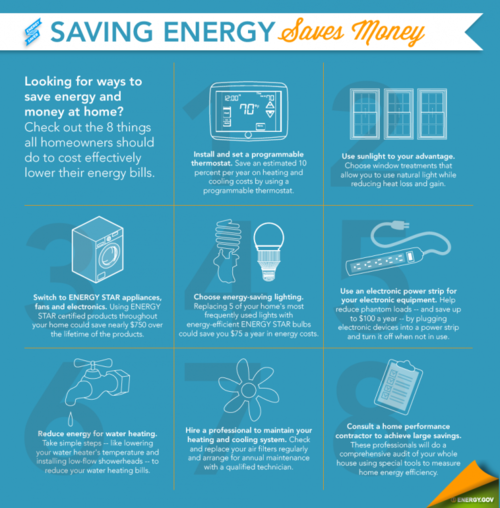 This Energy Saver infographic by energy.gov highlights the key areas of your home that could use some attention. In order to reap the benefits of an energy-efficient home, you must be aware of the areas of your home that are most prone to high energy use. Consult a home performance contractor to achieve large savings. A Home Energy Audit, otherwise known as a home performance evaluation, is the best thing you can do as a homeowner to seal up your drafty home for maximum savings. Before you do any major home improvements or renovations like replacing your HVAC system or paying for attic and basement insulation, you will want to make sure that you are using your money wisely. A Home Energy Auditor will conduct a complete home assessment of your energy use and leaks using high-tech gear, such as infrared cameras, blower door tests, combustion analyzers, manometers, and moisture meters. Certified Home Energy Auditors, like Larry & Sons Plumbing and Air, will conduct a comprehensive home energy report for you, which will cut on average 15-40% off your energy bill every month. Well, the audit itself won’t save you any money, but the recommended efficiency upgrades and improvements will! Getting the information you need is the first step on your road to an energy-efficient home. 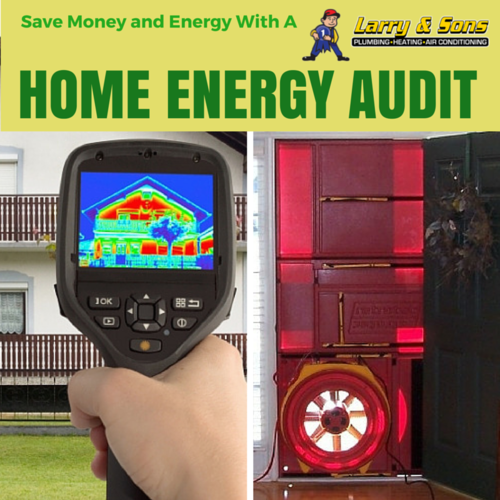 For a more comfortable, energy-efficient home, better indoor air quality, and lower energy bills, schedule your home energy audit with Larry & Sons today! For a do-it-yourself home energy audit guide, visit energy.gov. The DIY version toward an energy-efficient home is long and complicated. You must make up for the fact that you do not own the equipment necessary to perform a quick and nonintrusive assessment. If this is all too much of a project, the next best thing is to have your heating and cooling system checked out and tuned up by a professional every year. Space heating accounts for over 40% of your home’s energy use. If your furnace or heater is inefficient, you could be losing up to half of this energy. When the technician is there, you can ask as many questions about energy efficiency as you want. If you haven’t already, don’t forget to schedule your annual heating tune-up. We offer installation, maintenance and repair of boilers, furnaces, heat pumps, and geothermal systems. An energy-efficient home starts with your HVAC system. With our maintenance plan, we’ll remind you of your annual tune-up, provide 15% off all repairs, and much more! To learn about all the areas in your home where you could be saving, schedule a professional home energy audit in Maryland with Larry & Sons — 301-733-5428. We service Hagerstown, Frederick, and the surrounding Maryland areas. We also service parts of West Virginia and Pennsylvania.